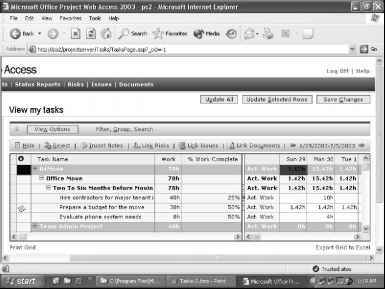 The Timesheet, or Tasks View, is the central view used by project team members in Project Web Access. It contains the assignments for each individual team member, along with any additional task and assignment information you want to provide them (see Figure 22-21). The Timesheet also includes fields the team members use to enter progress information—their actuals—that they periodically submit to the project server for you to then incorporate into the project plan. Figure 22-21. Project team members work with their individual Timesheets in Project Web Access. You can customize the fields that team members see in their Timesheet. Depending on the setup of your enterprise, you might also be permitted to adjust the tracking method for your project. 1 Make sure that Project Professional is connected to the project server, and that your project is checked out and displayed. 2 Click Tools, Customize, Published Fields. The Customize Published Fields dialog box appears (see Figure 22-22). 3 Review the Use The Default Method Set On Project Server to see its current setting. This is the setting established by the project server administrator. 4 If this setting matches the method you want to use to track assignment progress, make sure this option is selected. 5 If you want to use a different tracking method, and if the project server administrator allows project managers to change the tracking method, select the one you want under Always Use A Specific Method Of Progress Reporting For This Project. Select the Percent Of Work Complete option if you want team members to simply report percent complete on each of their assignments; for example, 15%, 50%, or 100%. This is the least restrictive and least time-consuming tracking method. With this method, the Timesheet includes a % Work Complete field that the team member uses for his assignment updates. Select the Actual Work Done And Remaining Work option if you want team members to report the total hours of work completed on an assignment so far, and the number of hours remaining to complete the assignment. This tracking method provides a medium level of detail. 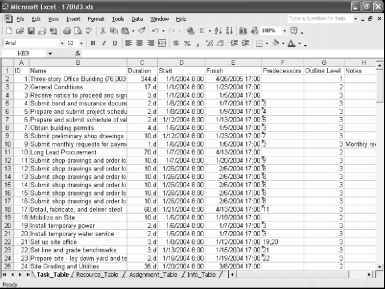 The Timesheet includes fields for total actual work and remaining work for each assignment. Team members enter those total amounts for each progress update requested. Select the Hours Of Work Done option if you want team members to report the number of hours of work completed per day or per week on each assignment. This is the most detailed tracking method, and is required for any organization using the Managed Timesheet Periods feature of Project Server. The Timesheet includes a field for each time period, either days or weeks, for the duration of the project. Team members enter the number of hours worked per day or per week and submit them with each progress update. 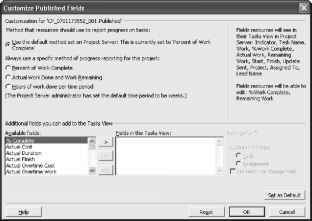 6 Review the list of fields in the right side of the dialog box. These fields are those that are required by the selected tracking method along with any additional fields that have been set up by the project server administrator. The fields listed in the first paragraph are those for which team members have readonly access. The fields listed in the second paragraph are those for which team members have read-write access. 7 You can add fields to this list using the Additional Fields You Can Add To The Tasks View section. Click any field you want to add in the Available Fields list and then click the > button. The fields listed include any custom task fields defined by the project server administrator in the enterprise global template (custom fields such as Date1 or Number4, and enterprise task outline codes such as Enterprise Task Outline Code7). New in Project Professional 2003, team members can work with value lists in outline codes added to their Timesheets. With the availability of value lists, it's easy for the team member to quickly enter the correct form of information while maintaining project data integrity. The selected fields are added to the Fields In The Tasks View list. By default, these fields are read-only to the team member. 8 If you want, change a field from read-only to read-write. Select the field in the Fields In The Tasks View list. Then under Settings For, select the Let Resource Change Field check box. 9 When finished defining the progress tracking method and fields, click OK. Note Work with your project server administrator to help determine the default timesheet fields and permissions. For more information about administrator responsibilities in customizing the Timesheet, see "Setting Up Team Member Timesheets" on page 629.